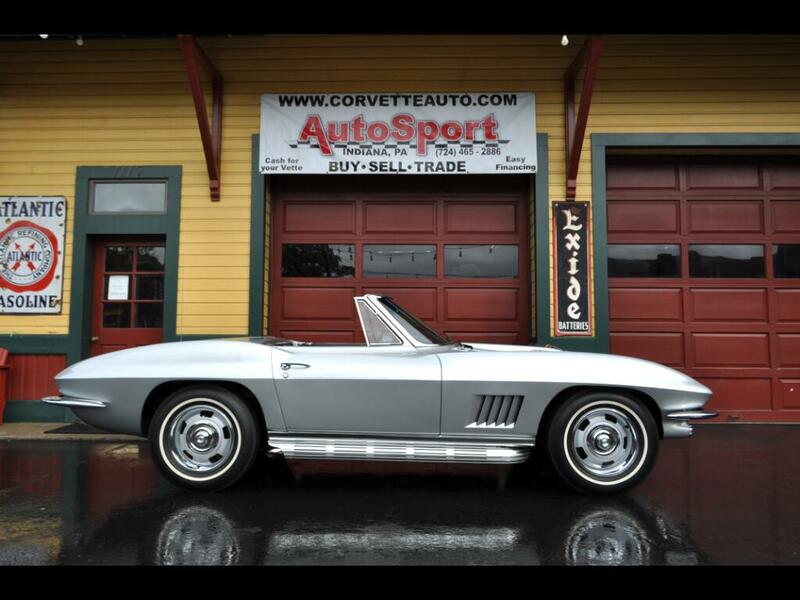 Used 1967 Chevrolet Corvette Frame Off Restored 435hp Org Build Sheet for Sale in Indiana PA 15701 AutoSport Co.
For sale is a complete frame off restored #’s matching 427ci 435hp Silver Pearl 1967 Corvette Convertible with its original Build Sheet!! We are excited to offer this professional frame off restored Corvette and please watch the video. We go into detail all around and under the car. This car does have its original build sheet of the gas tank, and its legible. The options on the tank sheet are as follows; 986 Silver Pearl Paint, White Soft Top, STD Black Interior, A02 Softray Tinted Glass, C07 & C08 Vinyl Hardtop, F41 Special Front & Rear Suspension, G81 Posi Rear Axle, K66 Transistor Ignition, L71 427ci 435hp Engine, M21 4-Speed manual Transmission, U15 Speed warning Indicator, U69 AM-FM Radio, added option not on tank sheet are Side Mount Exhaust. This car has been Judged at Bloomington twice and received the Silver Certificate twice. Some of the things holding this car back from gold was the fact that it was over restored and “to nice”. We have judging sheets and the certificates that come with the car. We have some pictures of the car while it was going through the restoration process. There are 100 pictures below you can pour over. There has been nothing left undone on this car and no expense spared. There is much to go over and please call us at 814-977-9219 or email us with any questions. Message: Thought you might be interested in this 1967 Chevrolet Corvette.